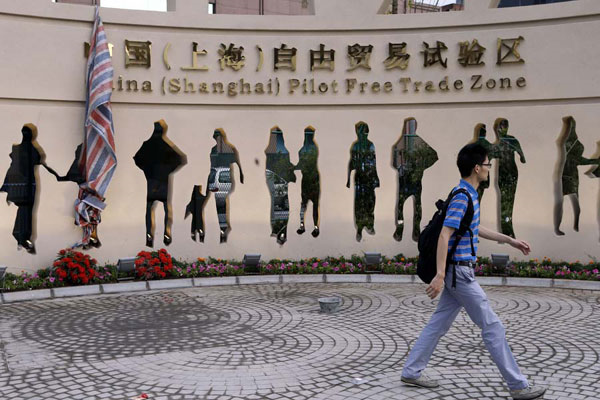 More than a year since the launch of the Pilot Free Trade Zone in Shanghai, China is preparing to open 3 new ones. The Chinese government is hoping to boost their slowing economy. On Tuesday, March 24th, The Political Bureau of the Communist Party of China’s (CPC) Central Committee approved a plan for establishing three new free trade zones in Guangdong, Tianjin, and Fujian. Unofficially, the launch date is planned for the 30th of March. But the precise, final dates are unknown. The Chinese government wants to test a broad range of economic reforms, including interest rate liberalization and fewer investment restrictions. Free trade zones are part of the Chinese government’s efforts to test reform policies, especially in the service industry. The goal is to improve the integration of the Chinese economy with international practices. 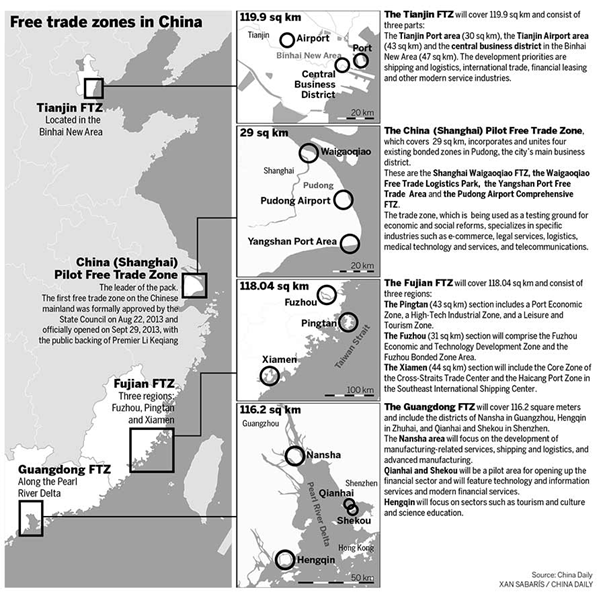 The new free trade zones are expected to take full advantages of their localization and industrial strengths. According to an analyst’s statement, the Guangdong FTZ will carry out programs for economic integration with Hong Kong and Macao. The Fujian FTZ will emphasise integrated development with Taiwan, while the Tianjin FTZ will focus on the unified growth of Beijing and the Hebei province. Detailed information is presented in the graphic below. The Fujian Zone, which will cover an area of 118 km2, will consist of three parts: the cities of Xiamen and Fuzhou and the county of Pingtang. The Fujian Zone will focus on trade across the strait and cooperation with Taiwan. Due to its neighbouring location and social links with Taiwan, Fujian FTZ is significantly important for the Chinese government. To facilitate the procedures of new company registration, a special, online platform has been created. It holds comprehensive information about departments that are related to cross-border trade, such as the industrial and commercial bureau and the tax bureau. Fujian FTZ also offers a wide range of innovative incentives for investors from Taiwan, and the Pingtang area will promote a number of new sectors in the zone, including e-commerce and financial leasing. The Guangdong Zone is intended to boost investment. The zone will consist of 3 areas: the districts of Nansha in Guangzhou, Henqing in Zhuhai and Qianhai, and Shekou in Shenzhen. The new zone will focus on a more open and convenient set of international trade rules. According to local authorities, Guangdong will be set up as a service centre for overseas investment to support domestic firms going global. The plan is also to integrate resources for international trade, finance, and shipping services from Hong Kong and Macao. The government is trying to further open up the financial market and support cross-border yuan settlement services. In the zone, a series of pilot programs will also be introduced, such as tax rebates for exporters, cross-border renminbi loans, and offshore data services. The Tianjin Zone will cover an area of 120 square km, and it will cover the Tianjin Port Area, the Tianjin Airport Area, and the central business district in Binhai. The priorities of the zone are shipping and logistics, international trade, financial leasing, and other modern service industries. Tianjin FTZ is expected to focus on long-term development. Foreign investors will have access to a broader range of economic activity as well as a wider choice of industries. The new FTZ will allow foreign investors to participate in China’s ancient salt trade for the first time. The decision was made a few months after the central government decided to dispose of the country’s 2,000-year-old monopoly on salt. In effect, the salt business has been opened to private traders. In this FTZ, it will be much more likely for foreigners to establish sole-proprietor businesses than enter into joint ventures. What’s more, foreign venture capitalists will be allowed to initiate and manage renminbi funds. Overseas investors will gain the opportunity to participate in one of China’s booming sectors – the design and manufacture of high-speed railways, subways, and intercity and urban rail systems. In order to avoid being left behind, local authorities made a proposal at China’s annual parliamentary session this year to be included among the next set of FTZs. They suggested creating a FTZ along the Yangtze River in central China’s Wuhan and another zone along the Silk Road in the Shaanxi province. The opening of 3 new free trade zones more than a year after the launch of the Pilot Zone in Shanghai is regarded as one of the boldest reform steps for decades. These decisions are designed to reform and open China to foreign traders. The authorities have already announced the establishment of a tribunal that will settle disputes related to the FTZ. It will also provide professional judgment in cases that require detailed legal knowledge, such as financial disputes and infringements on intellectual property rights. The opening of the new free trade zone is an opportunity to establish new commercial cooperation with Chinese entrepreneurs and deepen existing ones. In addition, a number of incentives that will be offered by the zones will encourage foreigners to enter the Chinese market. However, before you decide to take action, you should check the company you want to cooperate with, if it’s trustworthy. 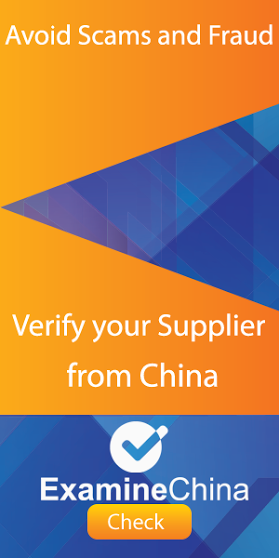 So we encourage you to check your Chinese partner with the help of ExamineChina. Why do you stop updating the information since May? Your blog is very useful! Thanks for your positive feedback, we will be back soon with more blog posts!